I arrived home yesterday morning in the pouring down rain, hands tangled and pinched in loads of grocery bags I was carrying from the car as quickly as I could, to find "Black Walnut" standing in front of the mudroom door, mewing incessantly. She was soaked from the rain and obviously distressed. Black Walnut is our cat who is about the size of a walnut. She's tiny. It seems she's never grown much bigger than her teenaged-kitten size, but lately she's gotten quite broad and hippy, if you know what I mean. I hate to admit that I didn't get her spayed in time and she "got married" before I had the chance to get her in to the veterinarian. We knew her time was close as she was getting as wide as she was long, waddling around the farm and eating enough food for an army of cats. So when I saw her waiting for me at the mudroom door yesterday morning, I knew something was up. And when she turned and I got a glance at her hind end (sparing you the details here) I really knew something was up (or down. or out, maybe). The girls and I quickly scooped her up from the rain and made her a nest of towels inside a laundry basket on the mudroom. And stood back like a bunch of nervous old ladies, cringing and fussing with her every cry and contraction. By late afternoon, dear little Black Walnut gave birth to five kittens and I now have a pretty good idea which lurking tom she "married". The girls were amazed, glued to the action, soothing her and telling her what a good mama cat she is. And now I hear new words in their vocabulary like "after birth" and "nursers" which makes me laugh. So our mudroom is now maternity ward and gets checked regularly. Often. My girls will be selling the kittens, to good homes only, for two dollars. Any takers?? Will they ship to Canada? ;)So sweet. seriously, sara, I wish I could ship them out to all my dear cat-loving blogging friends. Because I know they’d make such great homes. Sigh. I don’t know where you live but I’m sure it’s not close enough to me for one. Otherwise I’d totally take one!! They are adorable, congrats! Our cat had ten kittens when I was six years old- I still remember every moment. What an amazing, wonderful thing for your girls to see! and if someone knocks on your door and runs, and when you open the door there’s a basket with a kitten in it, it’s just my kids “pretending” to give you a kitten. wow! what a family experience! i just read your post about the wall hangings for your kids- i love this idea! i think when they hit 18 you should put them into a quilt…wouldn’t that be cool??? LOL! Got a chuckle out of that one! Seriously about to talk to Ryan about this. Noella LOVES cats and we still watch the video over and over of her carting your [then] kittens around the last time we were at the farm. She loved it! We need an excuse to head down your way anyway, right? 🙂 Too long. Oh how sweet! I just took in a new kitten so do not ring my doorbell! once upon a time I loved kitties. One had a litter in my closet. Then I married a man who had a kitty who wee-d on all of my furniture. Now he likes dogs. Like I do. AWWWW!!!! I remember once watching kittens being born and playing with the sweet little things while they grew. While I have been a very responsible cat owner and have always had my cats fixed, I do sometimes regret that my kids have never got to experience that. We have 2 cats now and a dog…otherwise I’d love one in the post! Can you post kittens?? Like chicks?? kittens for a blog giveaway. LOL. brilliant. 🙂 My son wants to know what I am laughing at…. Amazing. Kittens are so so so cute. What lucky girls to see that. you must talk ry into it! and yes, we need to see you guys. noella’s what, in eighth grade now, or something??? What a wonderful experience for your girls!I’m sure you will find loving homes for all of the sweet bundles! One more reason why home is a great place for school! Especially on a “farm”! We had a stray make our tree house home and maternity ward last spring. It was so sweet to watch her mother those tiny babes. My girls were totally enamored of the whole process. After the babies were born we adopted the mommy and one gray striped kitten. They have now become a very happy part of our lives. (Except when they use my garden beds as a litter box.) Every little person should experience the joy and excitement of baby kittens. BTW…I found your blog via Habit (which I love). I read your complex life post three times on my own and once to my husband. Really beautiful. Thank you for sharing. Congrats! How wonderful you were there for the birth…something that you just can’t learn from a book. :o) Great experience for you all. what a wonderful experience for you guys! and lucky for me, it appears there are no orange ones in this group. maybe i should say lucky for fatty! So sweet. Just intensified my desire for a kitty. For now, I should focus on the chicks that are arriving this weekend.Hope you find good homes for those sweet bundles. This brings back memories of home births from my youth. Reading your blog always makes me want to buy a farm just so my kids can have these experiences growing up! Hmm… can you send a kitten to Long Island??????? They are going to be beautiful cats, judging by their mother. I had a cat many, many years ago, who gave birth on my bed to four kittens, and my female dog, who had grown up with the cat, put her front paws on the bed and watched the whole process intently. 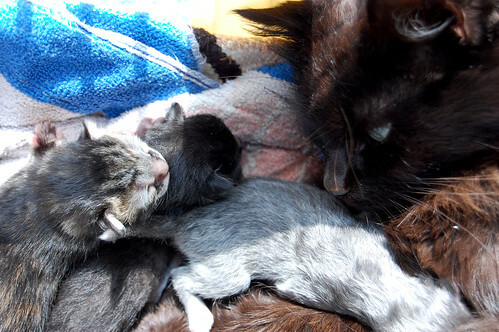 As the kittens were born, the dog helped to lick each one. It was amazing. I just sat there watching the whole thing unfold. As the kittens grew, they would pounce and jump all over the dog, bitting her ears and swatting her tail, and she would just lie on the floor and let them torture her. She was such a sweet animal. These are so adorable. Is Ireland too far?! awwww!! they’re adorable. wish I could take one off your hands, but my cat would be quite displeased. what an amazing story. so sweet. They are adorable! We have been thinking about getting a kitten. Are you any where near Northern Va? what a gift for you and your girls to witness such an event. fantastic! i have to say i would totally be checking constantly too.we would love to have one but we’re in toronto… a little too far i would have to say.it would make my little ones life! and mine i might add. i was promised by my husband that when i got pregnant again i could have a kitty… and well we’re expecting again, so im just waiting for my side of the deal.enjoy the fun new stage. hope you find great homes for them. cute cute cute! i remember watching my cat have kittens when I was about 8… i was fascinated! We’d have one if we weren’t so far away! kitten is my favorite word. well, right next to chicken. Oh how wonderful! What an education. I think by the time I was 13 I had seen several litters of puppies and kittens being born, one colt and even got to help “pull” a calf with my papaw. Its great birth control if nothing. Boy did you nail that image. I don’t know one woman who could not relate to that. Your writing gets better and better. ohhh! I love kittens. If we weren’t at our cat capacity, I’d be inclined to drive there and get one! so cute! Did you know that their can be multiple fathers to a single litter? 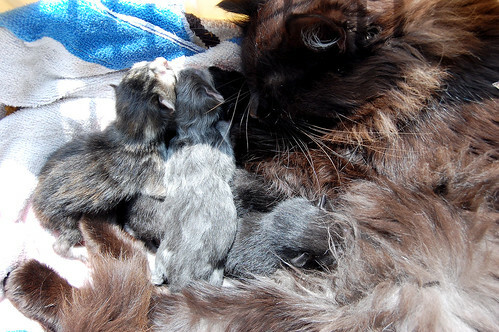 That may be why you have one doesn’t resemble the mother or the one gray tom. In any case, perfect diversion for Emma!